This was announced by United Bodybuilders of Northern Luzon (UBNLI) president Engr. Troy Mencio. According to Mencio, this year’s muscle showdown will include six divisions for competitors namely: Flyweight division 132 lbs. and below, Bantamweight division 133-143 lbs., Light weight division 144 – 154 lbs., and Open weight division 155 lbs. and above. Added attractions will be the Physique Division for Teen Physique competitors 19 years old and below in two categories namely Medium 5’6” in height and below and the Tall category for 5’7” and above height consideration and a Bikini Open which will feature female fitness enthusiasts. Prizes for the contest he said will be at 10,000 peso for division champions 3ft. Wood carve trophy, gift packs and bodybuilding supplements, 5,000 peso, 2.5ft wood carved trophy, and gift packs for 2nd place winners, 3,000 peso, 2ft wood carved trophy, and gift packs for the 3rd placers in each category. 4th to 6th placers will also receive 1,000 peso, 1.5 ft. Wood carved trophy and gift packs. The top prizes, he said, is a P50,000 cash prize, 5 feet wood carve trophy, gift packs and gift certificates for the overall champion in the selection of MR. PANAGBENGA 2019. Registration for competitors will be at the PFVR gymnasium, 8:00 – 4:00 pm on February 23, 2019, with the registration fee pegged at Php 2,000. Included in the fee are free musclemate sports gear, trunks and souvenir T-shirts for all participants. Competition proper will be at the PFVR gymnasium on February 23, 2019, Saturday at 6:00 in the evening. Contest sponsors also include Xtreme Gym, Gym Rat, Evogen, Trojans Gym, Aberprime, Mutant Gym, Furukawa Gym, Musclemate Sports Gear, Solane LPG, CVeJecks Pest Control, TJ, Valley Bread and Universal Mega Gas. Information about the competition can be obtained from Mencio or Edong Dominguez at telephone numbers: 0919 336 4214; 0917 0511 830; and 0936 403 3901. Mr. Panagbenga 2019 is an annual program sponsored by UBNLI and the Baguio Flower Festival Foundation, Inc. (BFFFI). 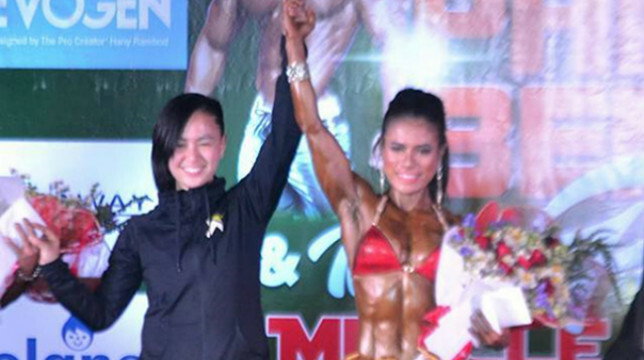 Banner photo: Nerrena Tejares (right) took home the women’s open fitness division of the 2018 Mr. Panagbenga & Ms. Fitness 2018 muscle showdown.